Finding a minimum weighted spanning tree might not be the hardest task, however, for trees with more vertices and edges, the problem becomes complicated. We will now solve this problem with Kruskal's Algorithm. Label each vertex (e.g. $x_1, x_2, ...$ or $a, b, c, ...$, etc…). List the edges in non-decreasing order of weight. Start with the smallest weighted and beginning growing the minimum weighted spanning tree from this edge. 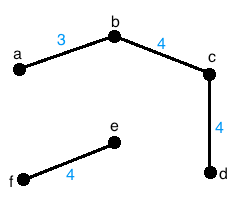 Add the next available edge that does not form a cycle to the construction of the minimum weighted spanning tree. If the addition of the next least weighted edge forms a cycle, do not use it. Continue with step 4 until you have a spanning tree. 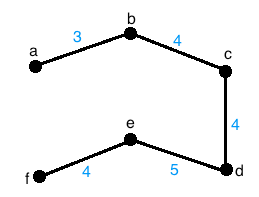 We will now apply Kruskal's algorithm to find a minimum weighted spanning tree..
We have already labelled the vertices in this graph as $a, b, c, d, e$ and $f$. The edges listed in non-decreasing weights are $3, 4, 4, 4, 5, 5, 6, 7$. We will start with edge $ab$ since it has the least weight. The next available edges we can are all of weight $4$. These edges are $bc, cd$, and $ef$. The addition of these edges does not form a cycle, so we can add them all to our graph. The next available edges we have are $af$ and $ed$, both with weight $5$. 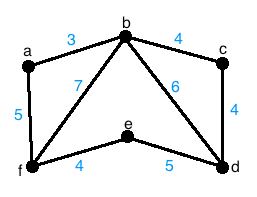 Adding either one of these edges results in a spanning tree of the final graph, so we can choose either. Let's choose the edge $af$. 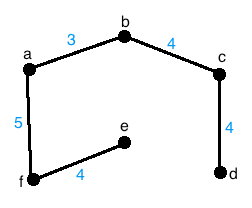 Just like with defining spanning trees for a graph, saying "the" minimum weight spanning tree is not necessarily correct as some graphs could have more than one minimum weight spanning trees.